The primary activity at Wupatki National Monument is viewing the ruins and archaeological artifacts of prehistoric Sinagua and Anasazi peoples. Facilities include a museum, book store, restrooms, overlook and short trails. Allow 2 hours to see five prehistoric pueblos; or, at least 30 minutes to visit the largest -- Wupatki Pueblo located behind the Visitor Center -- and to view museum exhibits. Bicycles are restricted to the Loop Road. Hiking is restricted to established trails only. 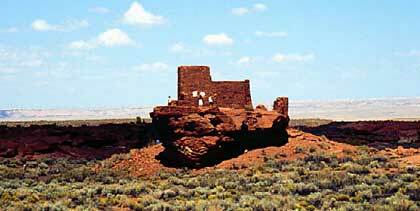 The backcountry of Wupatki is closed to hiking to protect fragile archaeological sites. Wupatki Ruins Trail from the Visitor Center, is a self-guided tour of the largest pueblo in the Flagstaff area. An infomative booklet is available identifying 17 stops along the trail, including a ball court, amphitheater.and the blowhole, a fascinating geologic feature. The trail is less than 1/2-mile round trip. The pueblo can also be viewed from an overlook (100 yards). Lomaki Ruins Trail is a 1/2-mile easy walk with access to several pueblos. Wukoki has a short (.2 mile) paved trail. Citadel has a short (.2 mile) paved trail. Nalakihu has a short (.2 mile) paved trail. Doney Mountain Trail, signed "View Point and Lunch Area," ascends from the picnic area to the top of the mountain (1/2 mile) for spectacular views of the surrounding area.